while they only recover their senses slowly, and one by one." 1. Europe learned from the US crisis and made all the right moves. The world has been in a rolling credit crisis for three years now. The deflationary collapse struck in the United States first causing an incredible drop in asset prices in late 2008. The government was fairly quick to respond to the massive demand-side slump. In fact, the government intervention was accomplished much earlier along in comparison to the Great Depression largely accounting for why another depression was avoided. The $700 billion Troubled Asset Relief Program (TARP) achieved major feats in restoring confidence in the banking system. Re-capitalizing major financial firms was the first step in stabilizing the collapsing equity markets and frozen credit markets. 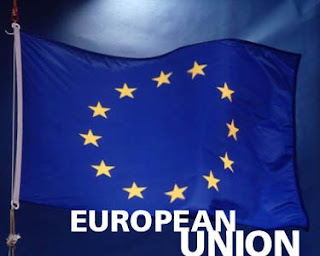 European markets started to fall in mid-April as sovereign debt fears hit front page and calls for the complete collapse in the euro monetary union were abound as the euro was dropping from highs of over $1.50 to cracking $1.20 on the downside. The EU responded even more quickly than the US did with the TARP program. The playbook had already been written by the US, the EU borrowed the best plays and put them into action earlier and more effectively. The EU announced a debt aid package for €700 billion that quickly halted the euro's decline. The next step for Europe was to give its banking system the seal of approval. The stress tests in the United States worked very well to build confidence by helping struggling banks re-capitalize and systematically show that most banks would be fine even in the face of possible worsening economic headwinds. The EU's stress tests were carried out brilliantly. They were just harsh enough as not to be seen as a farce finding seven banks in need of €3.5 billion in capital. Many may disagree with that statement in terms of the test's rigor and plenty of analysts did complain but the US equity market response Friday was muted to positive signaling a broader acceptance. The names of the failing banks were wisely leaked ahead of the results so there were no surprises for participants. The tests offered the needed assurance that most of the system was in good shape to withstand foreseeable volatility. 2. Second-quarter earnings reports have been great & the sentiment pendulum has swung positive. The chief concern this earnings season was weakness on the top line. 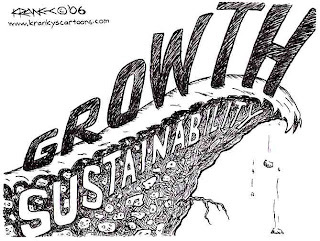 Analysts have been arguing for months that while cost-cutting is great and improves the bottom line, sustainable growth in earnings will only come from top line growth. Bespoke has a great chart out showing that these fears have not been realized so far. 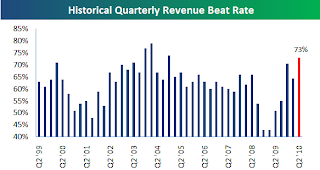 As of Wednesday 73% of companies have beat expectations on their revenue numbers, far better than the historical 62% average. 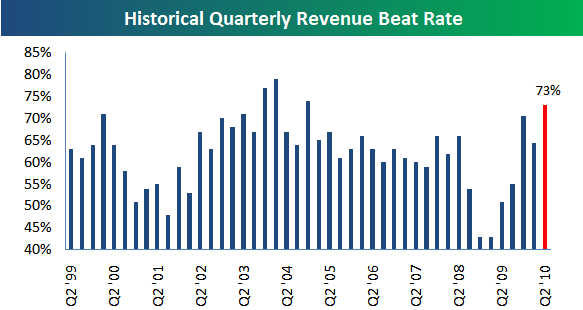 While earnings reporting is inherently backward-looking, it is clear that analysts continue to underestimate this recovery. On top of strong reports, earnings sentiment has dramatically shifted from week one of this season to week two. Bespoke assessed as of Wednesday that the average earnings reaction has been -0.4%. Yet, Friday was a game-changer. Anecdotally, the reaction difference between Intel (INTC) and Amazon (AMZN) was rather shocking. In week one of earnings season, on Tuesday night Intel (INTC) reported an absolutely astounding quarter amazing the Street by exceeding top and bottom line estimates on higher margins and aggressively raising guidance. INTC reported EPS of $0.51 versus $0.43 expected and revenues of $10.8 billion versus $10.3 billion expected. Gross margins expanded year-over-year from 51% to 67% for the second quarter 2010! INTC topped it off by raising Q3 revenue guidance well above $10.9 billion estimate to $11.6 billion. Second quarter 2010 was Intel's "best quarter in the company's 42-year history". How did the market reward INTC? After opening the following day 5% higher shares were sold aggressively throughout the day to close the stock up a marginal 1.7% for the day. By Friday all the post-earnings gains were wiped out. 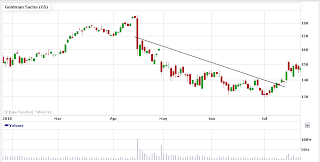 Amazon (AMZN), on the other hand, reported earnings on Thursday night this past week. AMZN produced a huge miss of analysts estimates with EPS coming in at $0.45, far lower than the $0.54 consensus estimate. AMZN eked out a top line beat by $100 million reporting $6.6 billion. The large prices cut for the Kindle device from an original selling price of $399 down to $189 to maintain competitiveness with the iPad, Reader and nook caused a significant reduction in margins. This report was the first major miss of estimates by a market leading company. Did the market punish AMZN? Hardly. While AMZN opened on Friday at $105.93, down 16.8% from the previous close, buyers immediately stepped in on the open snapping up the discounted shares. AMZN continued rallying throughout the day and recaptured nearly all of the day's losses to close down a very mild 1%. The change in sentiment is quite drastic. The pendulum has swung to the positive side as even a very disappointing report was confidently bought, that response coming in stark contrast to the selling seen after the absolutely steller INTC report the previous week. 3. The leaders to the downside have stabilized, GS & BP. 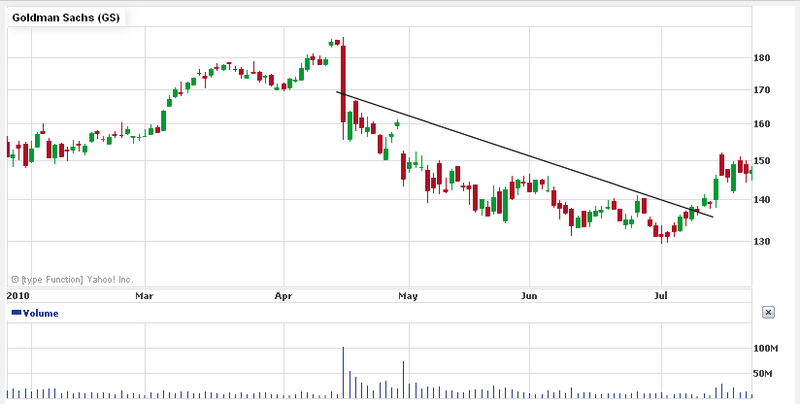 The SEC investigation into Goldman Sachs (GS) in mid-April marked the first significant drop in a leader of the market. 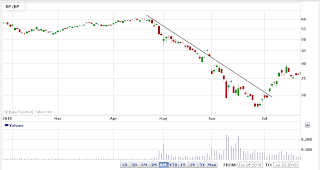 Over the ensuing months shares of GS dropped from $185 to below $130 by the beginning of July. The hearings, speculations, rumors all worked as an overhang to shares for months and acted as a major drag on the equity market. The Deepwater Horizon rig explosion on April 20th was another blow to the market. Shares of BP (BP) melted from over $60 to well below $30 by late June. The oil spill pulled down many others in the oil sector, particularly Halliburton (HAL), Cameron (CAM), Transocean (RIG) and Anadarko (APC), among others. Now, the SEC has settled with GS for a minor $550 million fine. In a broader context, the uncertainty over financial reform is behind us as Congress finally passed the financial reform bill. Shares of GS are on the rebound back up to the $150 area now. BP finally managed to stop the leak in the Gulf quelling fears of an unstoppable disaster, bankruptcy, etc. Shares of BP are now over $10 off the lows and the cleanup is well underway. 4. The first higher low is in place confirming buying interest. 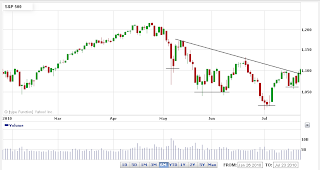 For the first time in this market correction, there is a convincing higher low in place on the charts. After a series of three lower lows, buyers have stepped in to buy at higher prices. Along with the higher low, the close on Friday amounts to the first higher high and takes out the descending trendline. 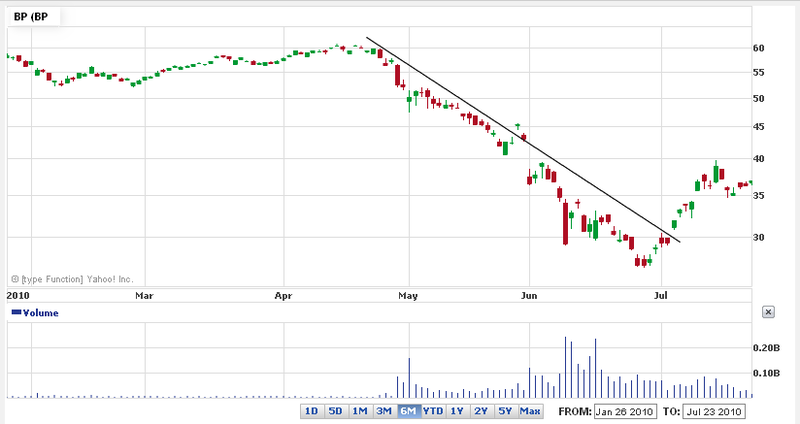 While the break of a trendline is not inherently bullish, it does signal a significant change in the rate of decline. The cocktail napkin technicals point to an encouraging change in previous trend. 5. Doctor Copper is forecasting a strengthening economy. What is Doctor Copper saying? A reading of the technical tea leaves in both copper and crude oil offers compelling evidence for the bullish argument. Something has clearly changed in the dynamics of copper. Once again, similar to equity markets copper had its first higher low put in and this past week achieved its first higher high. In just this last week, copper rallied 8.9% from below $3 to challenge the $3.20 level. It may take a few days but recouping the $3.20 level will be final confirmation of this rally. Crude oil is also showing signs of increasing demand. After breaking down below $70 per barrel in late May, crude prices have rebounded and are now bumping up against the $80 resistance level. Oil also has a higher low in place on the charts. Right when a trader gets used to trading one way, the market changes. This is happening again as it will become increasingly difficult to trade on the short side should my call be realized. Shorting can be thrilling because gains come very rapidly when they do as a result of panic-induced selling. As far as strategy goes, gains on the short side are meant to be taken off the table very quickly. As Keith McCullough of Hedgeye.com says, "There is no such thing as short and hold". I should have heeded this advice and brought in my shorts earlier rather than holding them back to flat after equities found support at the 1,050 level. The short squeeze is often the first move up the market. This squeeze is rapid because it is exactly the same type of buying as the selling was: panic-induced. Yet, after the first move, the momentum typically slows. Buying occurs in a much more controlled and logical manner than selling often does. I think of it in this way: buyers looking to enter positions use limit orders, capitulating sellers use market orders. The buying is concerted and rational, the selling is fast and indiscriminate. Buyers say, "work me into this position"; sellers say, "get me out now!" Profit-taking definitely occurs more logically than this but a lot of selling, especially in sizable corrections like the one we just saw results from irrational panic. Trading a new move higher will require longer holding times and much greater relaxation of anticipated levels. Panicking sellers are more acutely aware of price and will make decisions based on declining price. Buyers are typically not as aware of specific price and look to buy on pull-ins. Levels are therefore more fluid and active traders should be more diversified not only in the number of positions but also the timing of entering those positions. Allowing yourself to be wrong on timing by starting smaller and legging into a position slowly will reduce much of the stress that comes from mistiming purchases. I have been accumulating long positions slowly over the last couple of weeks. Although I was net short as of two weeks because of a long volatility and short market position, I kept buying small amounts of individual names. Now, all my shorts are off the table and I have a broad basket of individual names that I believe will do well in the next wave higher. Time to see if this thesis plays out. Disclosure of full portfolio: Long SPY, VMW, EMC, GS, LLY, AONE, SPWRA, IRBT, IMAX, DNDN, STP, CREE, ILMN, LOGM, AGU. Short GLD.